Dubem Okafor - a professor of African Literature and Post-Colonial Theory & Literatures at Kutztown University of Pennsylvania. To many students of African Poetry, Christopher Okigbo is one of the greatest to come out of the continent. 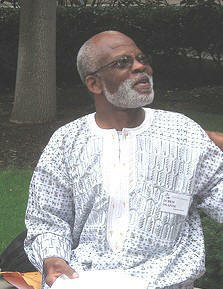 His life and work were celebrated in 2007 during the Christopher Okigbo International Conference. Dr Dubem Okafor presented "Okigbo as Cultural Globalist" during that conference. For those who were unable to attend the conference, here is a chance to read the paper "Okigbo as Cultural Globalist"
and the novel Sky-High Flames talks about the poetry of STACEYANN CHIN in the Reviews section of this magazine. 4The Clubhouse is the section of our magazine where you can place notices of your events such as exhibitions, readings, book signings, and performances. This is also where we list the poetry competitions organised by Sentinel or third parties. "I grew up in the village, and for me village shrines are the origin of installation art." interviews, poems and artworks remain with the individual writer of artist. All rights reserved.